The ultimate mix of industry-leading horsepower and fuel efficiency and available in wheel or track configurations. All Model Year 2019 Magnum tractors will include a three-year, 2,000-hour factory warranty. Choose from Wheeled, Rowtrac and Scraper configurations to best fit your operation. Need help deciding? High-horsepower row crop tractors offer fuel efficiency, operator comfort and reliable power for maximum productivity. No job is too tough for Magnum's advanced hydraulics, and transmission options. No day is too long with the Magnum’s comfortable cab engineered for a smooth, quiet ride. 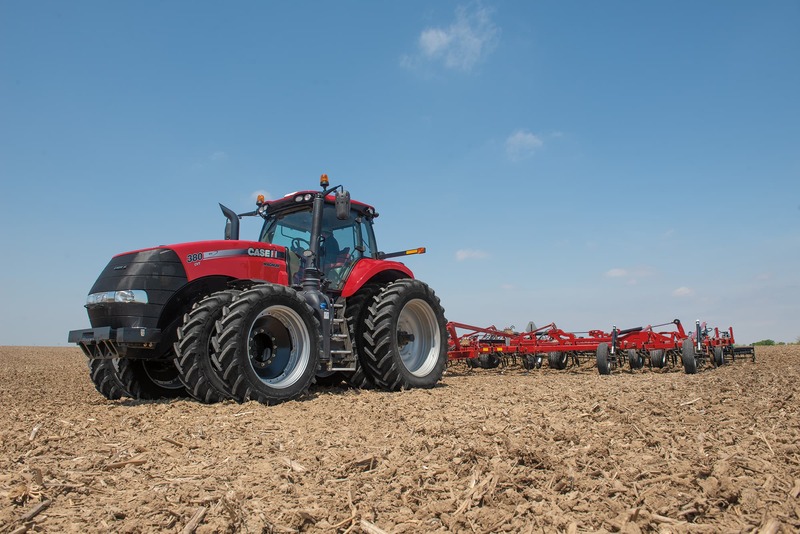 All Model Year 2019 Magnum Rowtrac tractors will be fit with track options that allow a maximum travel speed of up to 25 mph for all track widths: 16, 18, 21, 24 and 30 inches. A fixed-frame row crop machine that turns like a traditional tractor, yet floats like a Quadtrac. With 7 different row crop settings, the Magnum Rowtrac can be customized to fit between nearly any row spacing to reduce the compaction without damaging crops. Available on Magnum 310, 340, and 380. 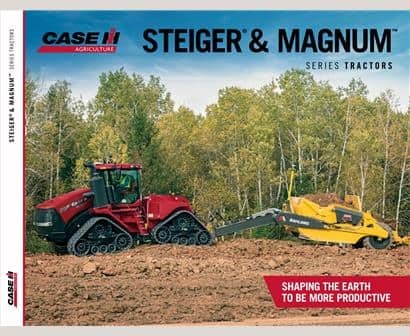 Most Magnum models are equally at home on construction jobsites pulling scrapers for land-leveling, site prep and general earthmoving. Magnum models, 250, 280, 310, 340, and 380, are easily configurable to handle heavier loads encountered in scraper applications. 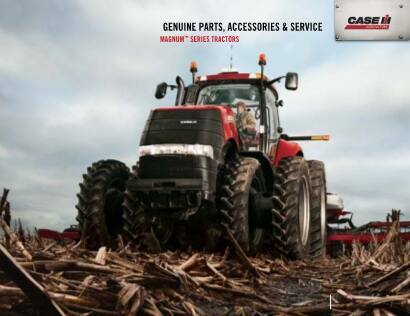 Case IH Magnum tractor 6.7 and 8.7L engines combine class-leading horsepower with proven emissions technology. What does that mean to you? Optimum power and fuel efficiency from an engine that has a legacy of performing in the toughest applications. Case IH FPT engines are developed and tested in Burr Ridge, Illinois. Our 6.7 and 8.7 L engines have clocked millions of hours on North American farms, field-tested and proven in the conditions you face. Case IH FPT engines achieve up to 14% power growth, providing the power you need when you need it. They also feature a power boost of up to 35 additional horsepower to maintain speed and productivity when roading or using PTO applications. Case IH is committed to an SCR-only solution for its unmatched overall fluid efficiency and power. Plus, it eliminates the need for additional components such as DPF and CEGR. You can enjoy low maintenance costs since the system allows for 600 hours between oil changes and doesn’t require active regeneration. Magnum engines offer innovations like engine braking, which reduces drivetrain wear and improves machine control. CVXDrive automatically chooses the most fuel efficient combination of engine speed and drivetrain selection to save fuel and reduce costs. You put in long hours in the field. Your tractor cab should help you work comfortably every hour of the day. Case IH Magnum series tractors feature a cab that allows greater comfort while in the seat. It is engineered to stabilize your ride, and reduce shaking and bumping in rough terrain. The simple, adjustable suspension in a Case IH Magnum Surveyor cab stabilizes front-to-back and up-and-down motions. It gives you a smoother ride whether on the road or in uneven terrain, reducing fatigue and increasing productivity. Adjust your speed, gears and direction and much more without even raising your elbow. The Case IH Multi-Control Armrest, with AFS Pro 700 control center, puts 85% of the controls operators use most at your fingertips. Switching between functions is even simpler with Magnum’s upgraded control center. Different-sized buttons allow for a softer touch and enable you to tell them apart by touch alone. With 68 square feet of glass in the cab, Magnum tractors give you an exclusive 360-degree full field of vision, including an unobstructed view of the hitch. The Magnum’s sloped hood optimizes forward visibility. When circumstances require you to work in darkness, visibility won’t be an issue -- even to the outside row units of your largest planter. Magnum’s LED and HID lights make it easy to get out and make an adjustment, fuel up or do whatever you need to regardless of the time of day. Magnum’s optional heated and ventilated red leather seat keeps you cool and comfortable in warm months. The heated function relaxes tired muscles and keeps you warm when temperatures drop. Keep your cell phone and tablet within easy reach with the Ram Mount System. And our portable cooler, which can be plugged into a Magnum auxiliary power outlet, keeps drinks or meals cool no matter how long you spend in the cab. Hydraulic flow can be configured to handle most any row-crop application and takes care of loader work too. Magnum tractors provide up to 75 gpm hydraulic flow so you can run at lower engine rpm for increased fuel efficiency without compromising operational performance. Choose between 4, 5 or 6 remote valves to match your machine requirement. Front Hitch: Available as factory-installed options on the 250–380 models giving you the ability to handle more 3-point implement applications.The front PTO adds to the versatility of this option. Rear Hitch: Category 4N/3 or 3N/3 hitch depending on model with a lift capacity up to 19,900 lb. Keeping all your tires on the ground is crucial for stability and performance. The Magnum’s front-axle suspension ensures that tires stay perpendicular to the ground for stability, traction and control over rough terrain. And that means a better ride at higher speeds. The design keeps you comfortable in the cab and solid Case IH design minimizes the number of moving parts, which means lower cost of operation. Rear axles are sized to match the horsepower to provide smooth and efficient power transfer. The Magnum 380 tractor comes with a 5" diameter rear axle to handle the heaviest loads through the toughest field conditions, providing the durability and longevity expected from a Magnum tractor. Advanced Farming Systems improves productivity and agronomic performance while minimizing waste. AFS delivers intuitive precision farming solutions that increase efficiency – all year round. Seamlessly monitor and control key machine functions across all Case IH equipment with the AFS Pro 700 control center. The easy-to-read display runs six screens on a single monitor. Plus, it features ISO11783-compliant instrumentation that works with equipment from other manufacturers. The factory-installed, easy-to-use AFS AccuGuide eliminates the need to steer in the field. Maintain perfectly straight and repeatable rows, reduce skips and overlaps, and save fuel. The new AccuTurn feature enables hands-free, end-of-row turning to maximize efficiency and productivity. The system also controls traffic patterns and decreases compaction for overlapping passes -- benefits that bring higher yields. Manage your machine data from in or outside the office with AFS Connect. This real-time dashboard provides alerts, precision agriculture and machine reports -- all at your fingertips -- helping you reduce waste, increase overall efficiency and make informed decisions that impact your bottom line. Uptime Is Always on Our Mind. Because It’s Always on Yours. Check your transmission oil or hydraulic fluid while standing on the ground. Industry leading oil service change intervals help keep you in the field longer. Make it easy to clean glass and adjust mirrors. Ready to handle any service issues to keep you going. A loader or an attachment turns a tractor into a versatile, powerful workhorse. The Case IH L785 and L795 loaders meet the needs of the full line of Magnum series tractors and feature fast, easy mounting and rugged, durable construction. Work with your Case IH dealer to identify additional loader options, attachments and accessories. Quick, easy mounting is a hallmark of Case IH loaders. Your Magnum tractor arrives with all loader mounting brackets, a grill guard, mid-mount valves, in-cab joystick and hose kits. Your Case IH dealer offers a full line of attachments to help you get the most productivity from your loader. Bucket options, forks, grapples, spikes, grips and cutters each attach quickly and easily. The 6.7L 180 hp Magnum™ 180 offers maximum versatility for your row-crop operations. Available in CVXDrive or PowerDrive powershift transmission. 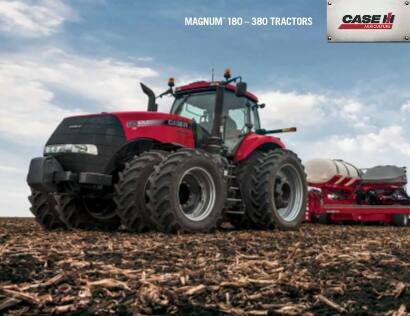 The Magnum™ 200 is powered by a Case IH FPT engine which delivers up to 245 peak hp. Available with front duals and either a PowerDrive powershift or CVXDrive transmission. The Magnum™ 240 comes standard with a easy-to-operate CVXDrive transmission, featuring a four-range design that increases efficiency and maximizes available power. The Magnum™ 250 is powered by a Case IH FPT 8.7L engine. Designed to meet tough conditions under heavy loads, the FPT engine offers up to 35 additional engine hp to meet demands. Available in PowerDrive or CVXDrive transmission. The Magnum™ 280 is designed for increased traction and reduced compaction. The 8.7 L engine delivers a max boosted hp of 320 and a PTO hp of 205 to power through all of your row-crop operations. Available in PowerDrive or CVXDrive transmission. The Magnum™ 310 is available in RowTrac™ or four-wheeled configurations, plus a choice of five different transmissions, for traction and more power to the ground in any soil condition. The Magnum™ 340 offers exceptional operator comfort combined with a max boosted 410 hp, plus an optional CVXDrive transmission lets you power through all your tasks, comfortably and smoothly. Available in four-wheeled or with Case IH oscillating rear RowTrac™ configurations. A state-of-the-art CVXDrive transmission is a standard feature on the Magnum™ 380. Available with RowTrac™ and front duals for maximum weight distribution and traction in any condition. Discover how the powerful and efficient Magnum tractors are built to fit the way you farm, season after season. 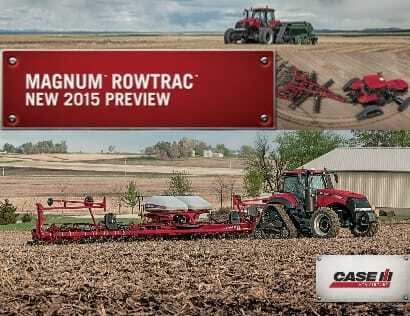 ​Configure and price your new Magnum Series Tractor. Customize it the way you want.